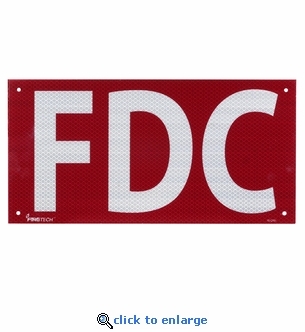 These reflective FDC signs clearly mark your fire department connection locations. These bold red and white FDC signs are silk screen printed on heavy gauge aluminum, then oven-baked for extra durability and finished with a reflective laminate. The metal signs feature pre-drilled mounting holes. Perfect for mounting on block or concrete walls. 3 or more qualify for Free Shipping.